“My Place” all Day Dinning restaurant At Gokulam Grand Hotel and Spa Bangalore. Obsidian Sport and Music Bar At Gokulam Grand Hotel and Spa Hotel Bangalore. Bangalore - The Garden City is a bustling metropolitan welcoming people from all walks of life. The city is well-connected through its close-knit transport system and witnesses thousands of people coming in for new opportunities, academics and to make a new beginning in this chic and classy city. Known for Lalbagh Botanical Garden, Vidhana Soudha, Cubbon Park, Bannerghatta National Park, Bangalore Palace and more, this city is filled with natural and man-made attractions. 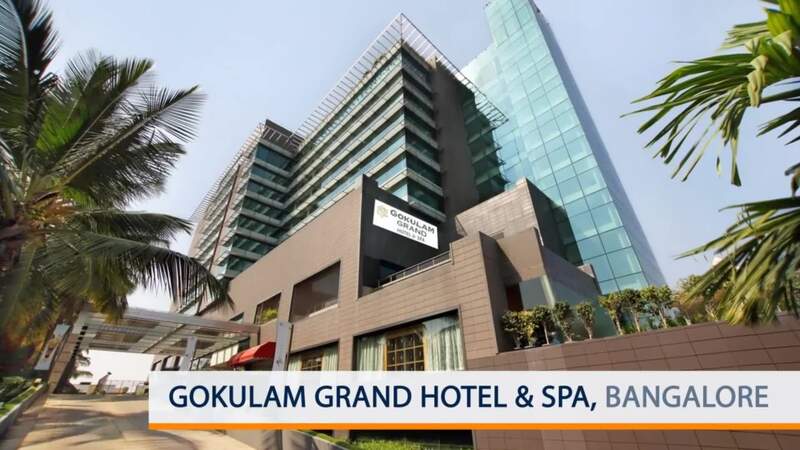 Gokulam Grand Hotel & Spa, is a luxury hotel conveniently located close to BEL road, Ramaiah hospital, Indian Institute of Science and other prominent locations of Bangalore. This business and leisure hotel in Bangalore hotel houses 5 types of affordable rooms and suites which are spacious, well-appointed and perfect for a grand stay in the city. At Gokulam Grand Hotel & Spa near New BEL Road, we have three restaurants - My Place All Day Dining, Mezzaluna and Obsidian Sports and Music Bar. Each of these restaurants are themed for a fabulous dining experience with your near and dear ones. Enjoy an array of delish treats and experience our impeccable service when you dine with us. At Gokulam Grand Hotel and Spa, we have four banquet halls - Gokula Ground Ball Room (6350 sq. ft.), Davos (2850 sq. ft.), Geneva - I (450 sq. ft.) and Geneva - II (450 sq. ft.). The halls are well-appointed for celebrations of all sorts. At Sohum Spa, enjoy signature wellness therapies that combine traditional Ayurveda and international treatments for truly soul-stirring rejuvenation. Aasman Gym, located on the terrace floor is perfect for your daily dose of endorphins. The gym at Gokulam Grand Hotel & Spa near Yeshwantpur is well-equipped for an intense workout for the fitness freak in you. So don't let travel stop you from staying in your best shape! India MICE Awards have recognised the excellence that Gokulam Grand Hotel has achieved as one of the leading players in the events industry. On 4th of October, in the event organised in Radisson Blu Hotel Paschim Vihar New Delhi, Gokulam Grand was awarded the prestigious MICE Awards 2018. It was an immense pleasure and honour to receive this award from dignitaries who are driving the growth of this Industry.